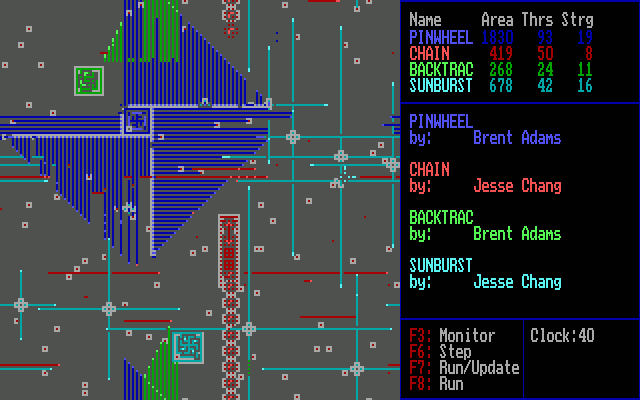 CoreLife is a programming game inspired by Core War and published as shareware for the PC by Brent Adams in 1993. 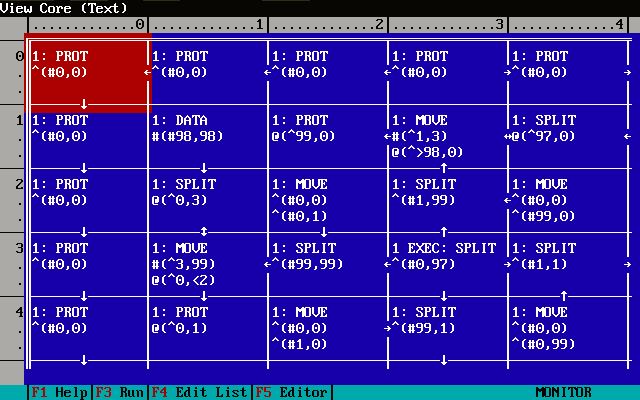 CoreLife is played on a 100×100 grid by programs written in a two-dimensional programming language. The aim of the game is to write a program to eliminate all opponents. Programs are loaded into the 100×100 memory grid of a simulated two-dimensional parallel processing computer. A program's strength is calculated by (space occupied) / (number of processes) and any conflict for a memory location is resolved randomly based on the relative strength of the programs. The complete specification is available in the CoreLife manual. There's also a short tutorial written by Jesse Chang — CoreLife Addressing Examples and a Quick Start Guide. CoreLife was published as shareware by Brent Adams in 1993, priced $19.95 (or $11.95 if you uploaded CoreLife to a BBS). Backtrac, Pinwheel, Sailboat, Snow and Spiral by Brent Adams (distributed with CoreLife). Chain, Curtain, Pepprpot, Rain, Ringtoss, Stars, Sunburst and Weave by Jesse Chang (available in c-lifej1.zip).